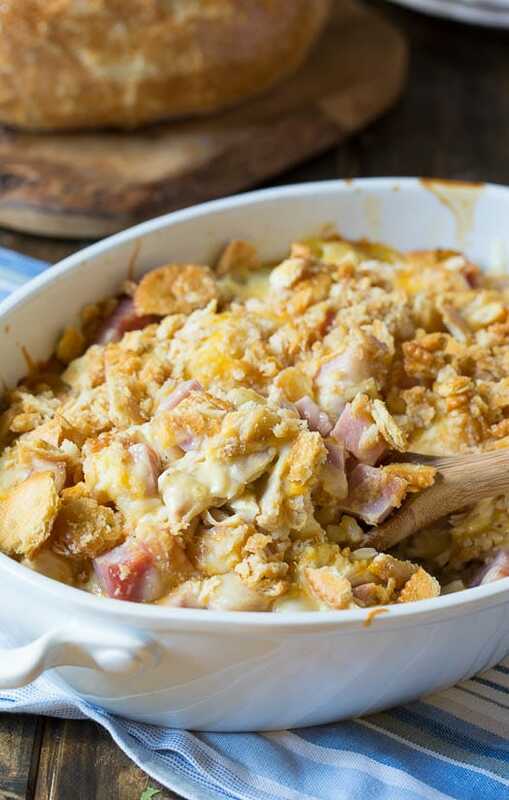 A delicious chicken casserole with all the ingredients of chicken cordon bleu: chicken, ham, swiss cheese all baked together over white rice. I’ve made it extra-flavorful by adding some cheddar cheese and a buttery Ritz cracker crumb topping. 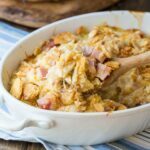 Using a rotisserie chicken or leftover chicken makes Chicken Cordon Bleu Casserole super easy to put together. This is a great recipe to make when you need a meal to take to a new mother or a family that’s going through a rough time. It appeals to a wide variety of ages and tastes and it is true comfort food that is bound to bring pleasure at the end of a hard day. 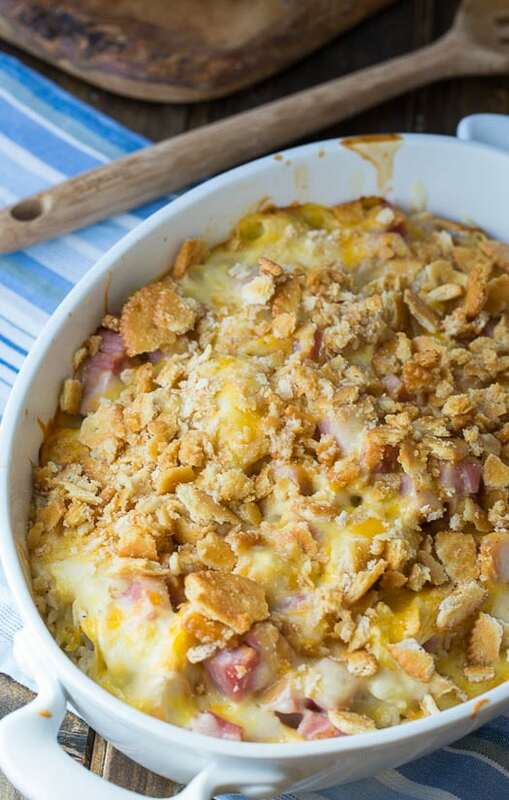 The combination of chicken, ham, and cheese is already an irresistible one, but a buttery Ritz cracker topping really takes this casserole over the top. Pair with some green beans or a salad and you have a fantastic meal to serve your family. If you’re looking for chicken casseroles, you’ve come to the right place. We have Chicken Cobbler, Chicken and Stuffing Casserole, Chicken and Asparagus Casserole, Chicken Cornbread Casserole, and Poppyseed Chicken Casserole. 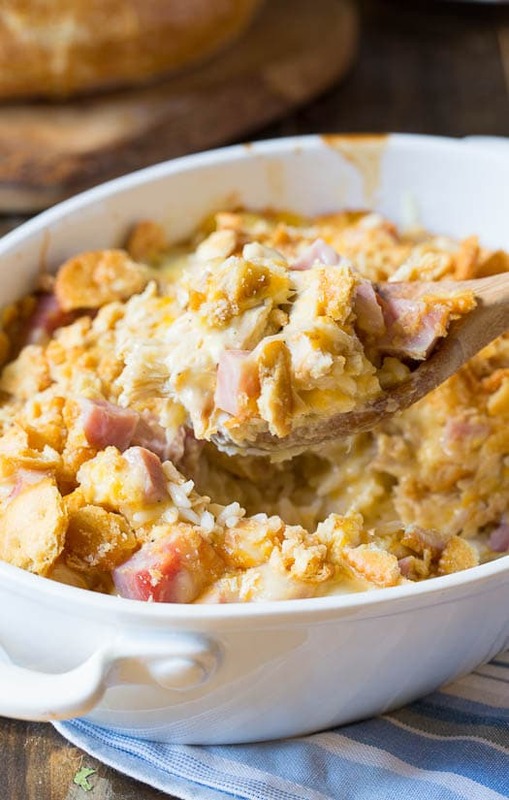 Chicken Cordon Bleu Casserole is a creamy mixture of chicken, ham, and cheese over rice. Topped with a buttery Ritz cracker topping for a truly comforting meal. Lightly grease a 13X9-inch baking dish. Preheat oven to 375 degrees. Spoon rice into bottom of baking dish. Top rice with chicken and ham. Evenly layer swiss cheese and cheddar cheese on top of meat. In a medium bowl, stir together chicken soup, milk, and chicken broth. Pour soup mixture on top of cheese. In a small bowl, mix together cracker crumbs and melted butter. Sprinkle on top of casserole. Place in oven and bake for 30 minutes or until hot and bubbly. This entry was posted in Casseroles, Dinner, Main Dishes and tagged casserole, chicken, ham, poultry. Bookmark the permalink. Can this casserole be made ahead of time? Or even made into a freezer meal? Yes, you can freeze it or assemble it up to 24 hours ahead of time and refrigerate. This is comfort food at its best! Love it! OK, this looks awesome, but now I’m going back to check out the chicken and stuffing casserole! 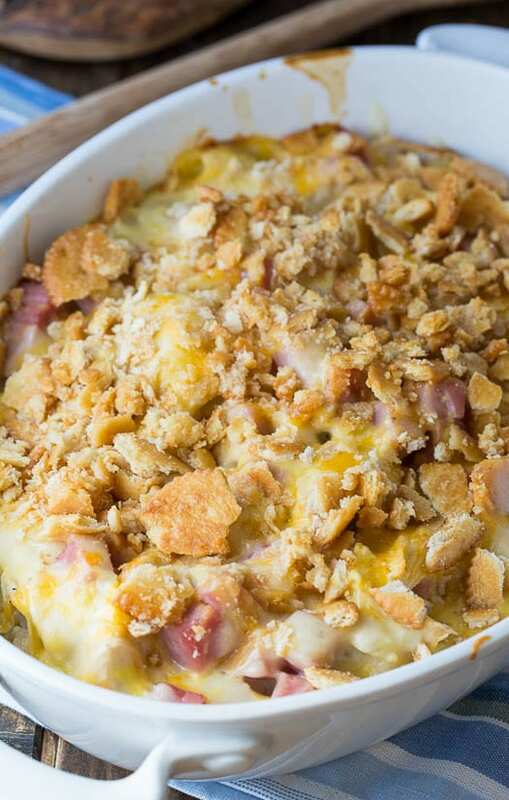 I love that you made Chicken Cordon Bleu into a casserole! It looks amazing and the best comfort food! I love how quick, easy and delicious this casserole is. Definitely a recipe I can see myself making – it is the ultimate comfort food! I love this rice dish…it sure sounds and looks delicious…great casserole! Perfect com for dish. I love chicken cordon bleu. I have to try your casserole recipe. I think meals are so much better in casserole form. This is definitely on my to make list! My husband just told me the other day he was craving chicken cordon bleu, perfect timing! Chicken Cordon Bleu is the best comfort food! I love that you created a casserole with the same flavors! Ohh man, this casserole looks and sounds so good! What a great idea for a casserole too. 🙂 I love that you added the ritz crackers on the top. So good! I’ve made chicken cordon bleu a few times, and it can be quite the pain. I love this casserole version much better — it looks so creamy and delicious! Pinning. Woa- Christin, this casserole has it all! And that buttery Ritz cracker crust is phenomenal! The casserole looks fantastic. Casseroles are such a great way to feed a family, so easy to make and so delicious. Oh boy – what a delicious casserole recipe! Total comfort food! This dish looks fabulous. I love casserole recipes, so comforting and so easy to put together. Thanks for sharing this recipe. What a wonderful recipe transformation, Christin! 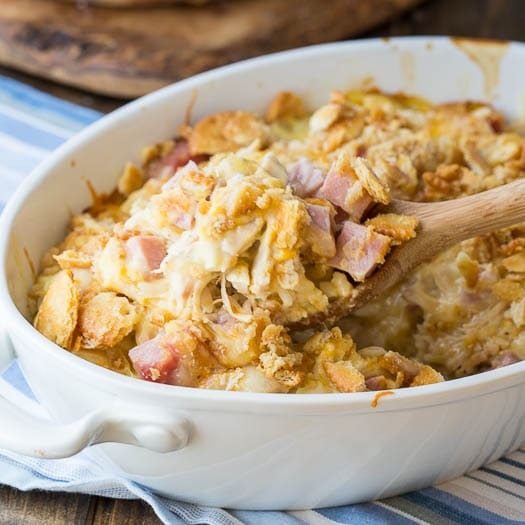 I love chicken cordon bleu but I’d never have time to make it at home; this casserole brings all the flavor without any of the fuss. 😀 Pinning! This looks like the best comfort food casserole, Christin! I absolutely love that you made this chicken cordon blue bake! Looks delicious and so perfect for a cool fall night! All the blog posts I’ve been visiting today are ON FIRE! This looks SO good Christin! Just so so so good!